Are you planning to visit Thiruvananthapuram? Read more about our recent travel to Thiruvananthapuram and about the places to visit in Thiruvananthapuram. 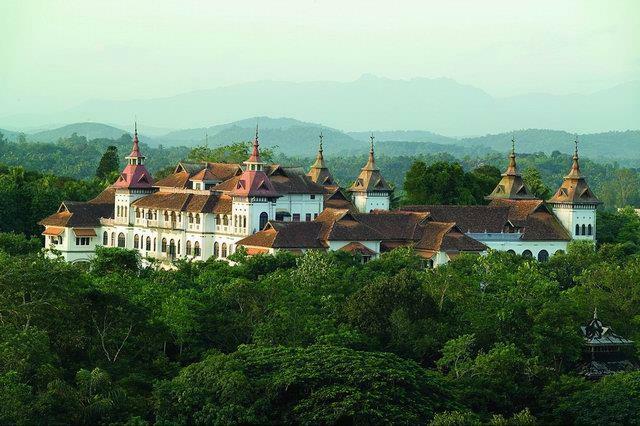 Find out more about hotels and tourist attractions in Trivandrum or Thiruvananthapuram city. It was our 10th wedding anniversary and we were looking for a place to visit and celebrate the big day in our life – a decade of being together. We were planning a trip to Singapore for quite sometime and think of to combine with this occasion. However, once we started planning for the trip, we learnt my wife's passport is expiring soon and we can't travel to Singapore with an expiring passport. So, we started looking at options to travel within the country. On the next day after our wedding anniversary, I had a barcamp to attend at Thiruvananthapuram, the capital city of Kerala and also one of the best places to visit in Kerala. So, at the end, we decided to travel to Thiruvananthapuram and Kanyakumari and combined the trip with my barcamp program to enjoy the tourist places in Trivandrum. We learned that there are many places to visit in Thiruvananthapuram that includes Aakkulam Lake, Trivandrum Zoo etc. But, before that we need to reach a hotel to take rest. I looked at few travel sites to book a hotel in Trivandrum, but I wasn't comfortable to make a booking just by looking at the online details. As I did not have time to read detailed hotel reviews, we decided to go with "plan as you go" and without an advance hotel booking. We started at 6:00 AM from Kizhakkambalam, a village near Kakkanad and the native place of my wife. We drove our Hyundai i10 automatic car, with my wife and eldest son John. There was no traffic in the morning and so we were able to cover a good portion of the total distance quickly. We reached near Kollam town by 9:00 and stopped half an hour for breakfast. It was surprising to note that there are very few good restaurants on the way to Thiruvananthapuram/Kanyakumari. In fact, we started looking for good restaurants after we passed Alappuzha and could not find any. Alapuzha, being one of the best tourist destinations in Kerala, have almost no good restaurants on the highway side after leaving the Alapuzha town. We kept looking for good Kerala restaurants on the highway side (NH47) and finally located a reasonably good one just before Kollam city. Actually, we stopped by a couple of small restaurants and asked for "Appam" and "Egg curry" and none of them had it. One note: In Kerala, the word "hotel" means "restaurants" in most cases. So, if you see a small shop with the board "Hotel Hilton", it is probably a local restaurant that chose a brand name without knowing the "Hilton brand". Using the word "hotel" to represent a restaurant is an accepted practice in Kerala. After the breakfast, we continued our drive but at a much slower speed. I felt lazy after eating food and also the traffic was much more after 9:00AM which naturally slowed down the speed. We reached Thiruvananthapuram at 11:30PM but decided to head towards Kanyakumari. As I said earlier, it was a trip with "no plans" and "no hotel booking". That allowed us to change the plans anytime as we like. We couldn't stop anywhere for Lunch in Thiruvananthapuram city, so we continued driving towards Kanyakumari and kept looking for restaurants on the way. Travel from Thiruvananthapuram to Kanyakumari was not easy as the previous stretch. We drove about 180km to Thiruvananthapuram in 4 hours, but the remaining stretch to Kanyakumari was only 125 km and took about 3 hours. The roads from Thiruvananthapuram to Kanyakumari were much smaller and slower. Traffic was pretty high and the roads were passing through small towns and villages. Especially, the Tamil Nadu side of the driving was not like a highway at all. We could not locate any good restaurants on the way to Kanyakumari. At last we found a good restaurant (at least in the appearance) and had lunch there. The name of the restaurant was "Archana". After lunch, we continued our journey to Kanyakumari . At the entrance to the town, we were stopped by few people and asked for entry fee. Initially we thought they were collecting donations and so we tried to drive away, but they jumped in front of our car and shouted the words "Toll, Toll, Toll". We saw a small board that has listed the entry fees for various vehicles. I think the fee for car was Rs 20 or Rs 25. We paid the money and continued. Are you looking for the best buffet restaurants in Ernakulam, Kerala? Kerala is not just the best tourist places in India, but it offers great food as well. Find the address and details of Yuvarani Hotel in Ernakulam/Kochi.